Extremists of the Islamic State (ISIS) on Monday beheaded a Syrian man in the northeastern Raqqa city on charges of ‘apostasy’, activists and eyewitnesses reported. The ISIS-led Hisba police arrested a 51-year-old man in Raqqa. “Hours after his arrest, the Sharia Court issued a statement accusing the man of apostasy,” local media activists Ibrahim al-Raqawi told ARA News. “The man was beheaded in front of hundreds of people in the al-Maari square on Monday afternoon,” al-Raqawi reported. 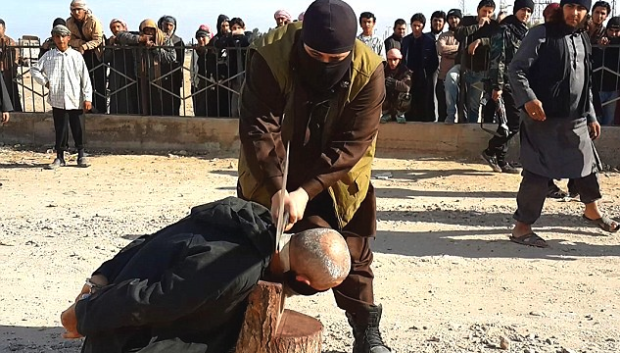 According to local sources, ISIS militants have been forcing the people to gather in public squares to witness the punishment of people accused of violating the rules of the group’s self-declared Caliphate. “Over three years of ISIS control in Raqqa, we have seen dozens of execution cases. Even children are demanded to attend such brutal acts by ISIS,” an eyewitness told ARA News, speaking on condition of anonymity. “Most of these civilians are being brutally punished on baseless charges. ISIS is just trying to keep people terrified in order to show that it’s still in power in Raqqa,” he said.